Getting a good job is hard, even without a criminal record. It’s much harder with a history of jail time and no high school diploma. That’s one reason OCCC is offering GED classes in the county jail, halfway houses and mental health facilities. The goal is to give people a better shot at work on the outside. The college added these locations in the summer of 2015, said Alan Dale, OCCC’s College and Career Readiness Program manager. OCCC acquired the additional alternative high school education sites from Oklahoma City Public Schools. The district wanted to steer away from adult education and offered the program to OCCC, Dale said. The acquisition includes only “clients,” or inmates of the facilities partnered with OCCC, such as the Oklahoma County Jail, said High School Equivalency Instructor Rodrick Whetstone. 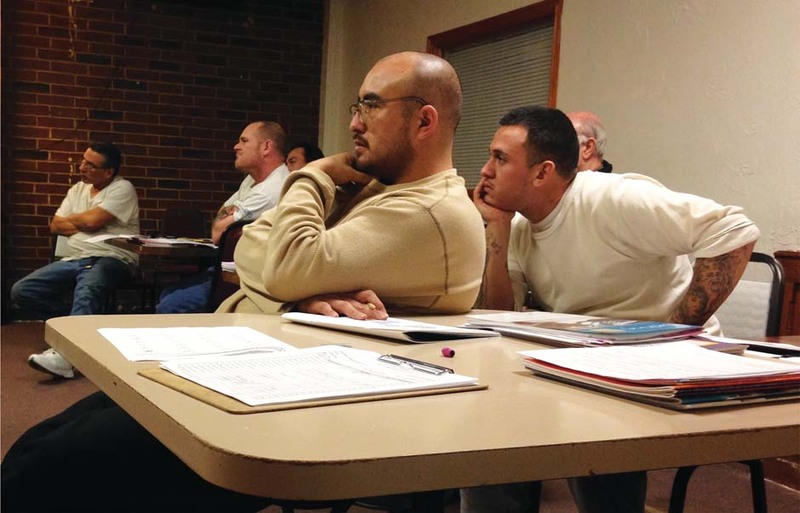 “Typically inmates in the class are required by the state to get their GED,” he said. Once a person is released, the person can attend any of the other GED classes offered around the city. OCCC offers one of the largest GED programs in the state, Whetstone said. Dale said OCCC has the unique opportunity to provide these adults, who have made one too many mistakes, a chance to turn their life around. “By teaching them necessary basic skills and providing a chance to take their GED test, we hope it’s the beginning of a better life for them, their families, and the community,” Dale said. Whetstone said he teaches at two correctional facilities, Center Point Inc. and the Oklahoma County Jail. He also has GED classes at NorthCare, a mental care facility and Community House, similar to a halfway house. All are located in Oklahoma City. take the exam. This improves the odds of not returning to the system they’re currently in, Whetstone said. Classroom norms are not always followed by these students. When this reporter attended a GED class at Center Point correctional facility, the students were actively engaged during the math portion of the class and asked questions without any hesitations. Whetstone said many of the students are challenged by low education achievement in the past, combined with being out of school for many years. During a class break, inmate Juan Saldaña, 33, of south Oklahoma City, said math is his hardest subject. Whetstone was demonstrating multiplying fractions. Saldaña said he dropped out of high school in the 10th grade. He plans on taking the GED exam as an inmate so that when he’s released he has a better chance of finding a good job. Saldaña said he has five children to think about. Math is also a difficult subject for inmate Michael McCurtain, 48, of Shawnee, who dropped out halfway through his junior year in high school. McCurtain said instructor Whetstone breaks the problems into steps which helps him understand and learn the subject better. Whetstone said he tries to make adjustments for their situation. “I want them to feel comfortable because most of them haven’t been in a school type setting in 10 to 15 years,” Whetstone said. McCurtain said he arrived at Center Point Inc. in December. McCurtain is serving time for forgery and domestic abuse. Inmate Michael Burks, 39, from Enid, is serving time for burglary and probation violation. Burks said this would be the first year he misses his children’s birthdays. This made him reflect on his future and the actions he will need to take in order to accomplish his goals. “I plan on getting my GED, going to college, bettering myself and my family,” Burks said. Although he’s not certain what he would major in, he thinks majoring in graphic design could be a possibility. “I need a career, not just a job,” Burks said. Burks said he’s been in the class since November of 2015 and the most challenging subject for him has been writing and grammar. At the beginning of the English portion of the class, Whetstone starts with a 10-minute timed writing assignment. “I have it set up where they write a paragraph every class period so when they get to the test, they’re not overwhelmed,” Whetstone said. The organization of the curriculum and incorporation of activities are essential to student engagement, Whetstone said. He said when a student finishes a paragraph, the student gets a sticker. Whetstone said approximately 45 to 55 students are enrolled in his spring semester classes, most of which are men. Whetstone was hired onto the OCCC staff in July. Supplies such as workbooks, paper and writing utensils are provided to students. Dale said the program is funded through a five-year continuation grant. “State budget cuts in respect to education would not affect the program because it’s funded through a grant,” he said. OCCC Professional Development Institute continues to offer GED classes to anyone 18 years or older. Registration for orientation and practice tests are offered every two weeks. For more information contact the OCCC Professional Development Institute at 405-682-7562 or visit the office located at 7124 S. I-35 Service Road, Oklahoma City, OK 73149.